Rooms, services The guests of Blue Mountain Resort Szklarska Poręba may stay in 240 nicely furnished, comfortable rooms in Szklarska Poręba. With child-friendly services being available the hotel is also suitable for children, and would be pleased to host all members of the family for your stay. The hotel welcomes small pets for your stay for an extra fee, allowing you to take your four-legged friend with you. Since the hotel has an own restaurant, you may also try fine local meals on the spot. If neccessary, you may leave your car at the parking place of the hotel for an extra fee. Refreshing wellness services will be available to you on the spot, for the details please read the information sheet. You can also bring your laptop for the holiday, for there is wireless Internet connection (WiFi) available at the hotel. An exact and detailed list of equipment in the rooms and of the services provided by Blue Mountain Resort Szklarska Poręba you will find on the information sheet below and on the information sheet of the individual rooms, including any applicable additional fees. Location Museum of Walloon Traditions is 1 km, Żelazny Tygiel Museum 300 meters, Explorers' Adventure Park 1.1 km, Szklark Waterfall 1.7 km away. Catering Your booking does not include catering at the displayed prices. When booking a room, a different type of catering may also be requested, the hotel is offering the following opportunities: half board, breakfast, no meal . Payment You may pay your reservation by the following payment methods: cash, debit/credit card. 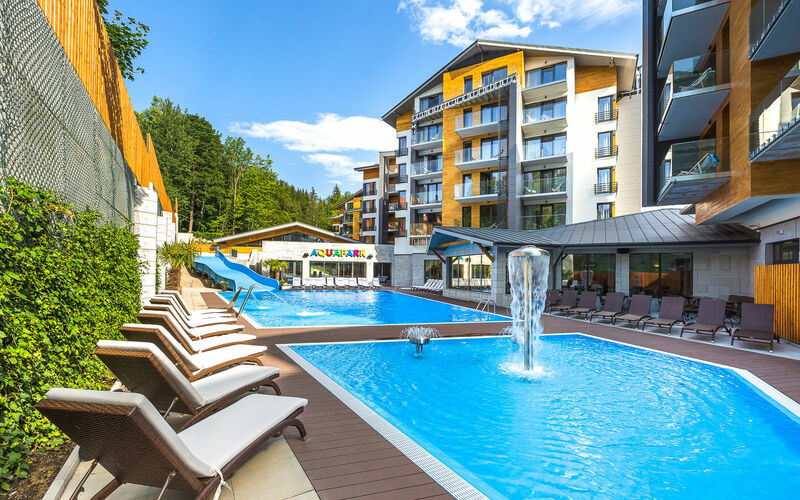 Prior to finalizing your reservation Blue Mountain Resort Szklarska Poręba requests 30% advance payment. Arrival, opening hours The earliest check-in time to your room is 16:00, the latest check-out time from your room is 11:00. The personnel of the hotel can speak in English, German and Polish with you.